The lock and the https designation indicate we have a SSL certificate and HTTPS connection. In simple terms this means all communications between your browser and our site are securely encrypted. This would be vital if you were parting with your credit card info (which you aren’t 😃) but in any event, any information we share is safe. We are told that from July this year Google Chrome will be marking a website as “Not Secure” if it is not protected with a SSL certificate. Having said that, I have just clicked on a little information icon, on a site without SSL, and a warning popped up that my connection to that site was ‘not secure’. It goes on to warn that I should not enter any sensitive information. So there you have it. If you are a small business owner and don’t yet have the lock icon that represents a secure website, it may be in your interest to talk with your web host. I would be happy to share my layman web enthusiast perspectives if you would like to chat. In our IMPACT! training for trainers course we discuss and demonstrate some of the multi-sensory tools that trainers have at their disposal. Given the time we have for this section, we hardy touch sides, there are so many possibilities out there. Despite the detractors who (rightly so) warn against ‘death by powerpoint’, Powerpoint (and in my case Keynote) remains the number 1 ‘go-to’ tool for the trainers in my courses. So I was interested to find an article (on a google search of course) where Jane Hart compiled the Top 100 Tools for Learning in 2015 from the votes of over 2,000 learning professionals worldwide. I suggest you follow the link to her website where you can explore all 100. I discovered that I personally use 7 of the top 10, which I list here. 1. Twitter - nope, I must confess that I’m not into twitter. 2. YouTube - yes, it’s a rich source of short video clips that can add value to a data show. 3. Google search - what can I say, a rich source of information and more. 4. Google Docs - no, I use the Microsoft and Apple suite of tools to generate course material. 5. Powerpoint - well yes, but being an Apple fan I most usually use Keynote, unless I leave a client with a complete training module, in which case I customise it in Powerpoint. 6. Dropbox - yes very useful for transferring large files and sets of pictures to my learners. 7. Facebook - well yes we do have a Facebook page, please go in and Like, if you like us that is 8. WordPress - well no, we develop our website (this one) in Rapidweaver which we are really happy with and it’s great for Mac users. 9. Skype - yes, when I travel Skype is a great way to keep in touch with clients. I guess it could also be used to communicate with learners but so far I have found that we are able to communicate well via emails when I am away. 10. Evernote - Yes its now my go-to app for recording information that I may want to access on my computer and my phone. I’m interested that Prezi came in at number 11. We talk about it and I demonstrate its use on our ‘train the trainer’ courses but I have yet to find someone who comes into the course having used it. I am aware of one of my learners (my son ) who went away inspired and used it to good effect within an important presentation he had to make. What are your top go-to training/learning tools? It would be great to get further input into tried and tested tools and their application. I was at the beach the other day and watched with interest as a few blokes worked together to pull in and attach their fishing boat to the boat trailer, which had been backed into the water by one of them in his car. The process was not straight forward, requiring some skill on the part of the driver and some strength and co-ordination on the part of the others. This was clearly a case of TEAMWORK in action. It got me thinking again about what was required for a bunch of people working or playing together, to be an effective team. The first thing is a clearly communicated and mutually bought into objective or goal - a common purpose. Secondly - Clearly known and understood individual roles, for which the team members have the ability and training. Thirdly - Coordination, so that people are in the right place at the right time doing the right things. This could be achieved by the team themselves if they are fully experienced and in tune with each other and if 1 and 2 are in place. However in most instances this requires that one of them is in a leadership role. In the case of the friends with the boat, the task would have been achieved more efficiently if all 3 requirements were in place. Having said that, they clearly had a common purpose, fighting the waves to get the boat onto the trailer. They looked tired. I hope they were able to celebrate success with some freshly grilled fish. What are your views on the characteristics of effective teams? This is rather an unusual blog for me to write. I am doing so in the hope that I may be able to help someone who has the same problem. This will only be relevant to those who work on mac computers. The frustration is as follows - You have upgraded your computer and it comes with ‘Keynote’ for developing your training presentations. (My current version is 6.5.3) You go to open one of your keynote slide presentations that you developed on your old computer still sitting at keynote version 5, which was part of the iWork’s 09 suite. You find that it gives you a message that v6 cannot open v5 keynotes and you must first open in v5 then save it and it will open in v6. But here’s the thing, you no longer have a computer with version 5 and when you search the web you can’t find it anywhere, certainly not from the apple website. 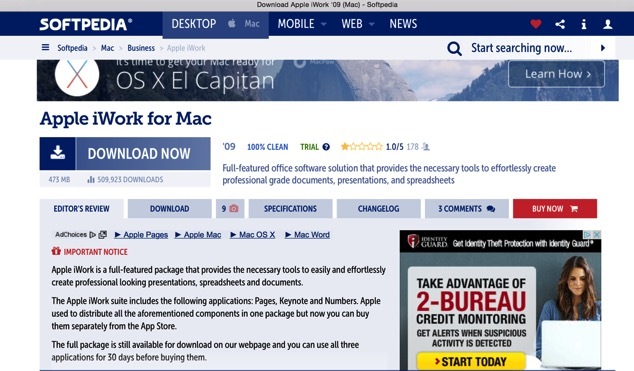 Searching for a solution on the internet you find suggestions that if you upgraded to Keynote 6, version 5 will still sit on your computer under a file called iWork 09. This does not help however if it’s a new computer and you wiped your old computer before selling it. The next thing people suggest is to purchase an iWork 09 cd from eBay. This is one solution, but most people feel aggravated that they have to pay for a solution. You will end up downloading some software that you don’t want. Its these kind of things that make people distrust downloading from this type of site. 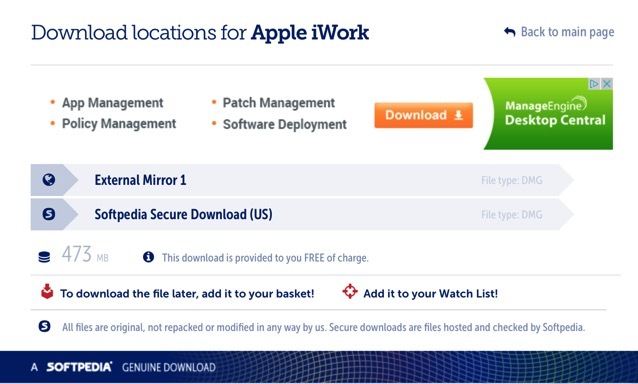 What you should do now is to click on the banner that says External Mirror 1 (I never tried the Softpedia Secure Download because I am not in the US) The normal download process will happen, as you will know from any software that you download when working on a mac, and you open it in the same way. I hope that this helps somebody else who has had the same frustration when trying to open a Keynote 5 (iWork’s 09) file with keynote 6. Whilst I am sure that things will go as planned for you, I obviously leave this entirely to your judgment and can accept no liability if anything goes wrong for you. For those who are used to finding and downloading software from sites such as Softpedia you will easily relate to what I have said above. Please feel free to share your thoughts, alternative ideas and experiences.